After the conclusion of MBC ultra popular drama series The Moon that Embraces the Sun on March 15th, 2012 with a very high viewership ratings, next week the Wednesday and Thursday drama series will launch a round of battle, which include MBC’s The King 2 Hearts starring Lee Seung Gi and Ha Ji Won, SBS’ Rooftop Prince starring Park Yoochun and Han Ji Min, and KBS2’s Man From the Equator starring Uhm Tae Woong and Lee Bo Young. In the battle of three Wednesday and Thursday drama series by three major Korean TV stations that are debuted at the same time in January 2012, The Moon that Embraces the Sun turned out to be the big winner from start to finish. With almost 20% audience ratings on debut, it surged to 42.2% at its final episode, suppressing the other two dramas at the same time slot, including SBS’ Take Care of Us, Captain starring Ji Jin Hee and Ku Hye Sun and KBS2’s Wild Romance starring Lee Dong Wook and Lee Si Young. After these two dramas ended with low ratings in advance, SBS and KBS2 TV stations dared not to debut their succeeding drama on the face of unstoppable momentum of The Moon that Embraces the Sun, and was broadcasting other programs during the last few weeks. KBS2 aired the 4-episode Ordinary Love for 2 weeks, the ratings were indeed rock bottom. While SBS’ aired the last few episodes of Take Care Of Us, Captain and special episodes for popular Monday and Tuesday drama, Salaryman Cho Han Ji. 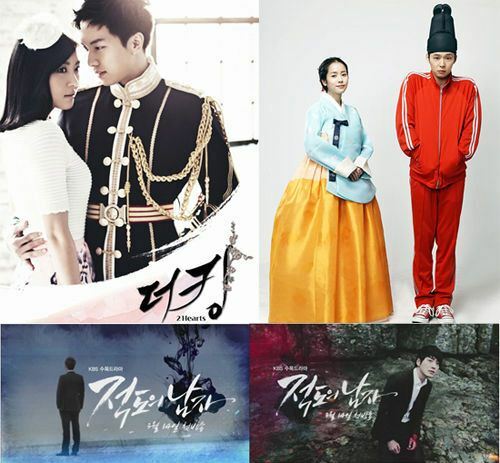 After The Moon that Embraces the Sun rang down its curtain on March 15th, 2012, from March 21st, 2012 onwards, the three major TV stations will debut all new drama series for another battle. This time, it’s really hard to discern who can win. First is the drama that succeeds The Moon that Embraces the Sun, The King 2 Hearts, starring by two popular and box office guaranteed actors, Ha Ji Won and Lee Seung Gi. The drama is of comedy genre, describing the irritable North Korean Special Forces instructor and South Korean prince are staging a political marriage and then gradually truly fall in love. SBS is debuting the Rooftop Prince, a time traveling drama which is been popular in recent years, and starring Park Yoochun and Han Ji Min. The popularity of two actors is comparable to Ha Ji Won and Lee Seung Gi, becoming a duel between two strong pairs. Rooftop Prince depicts the interesting story of ancient prince who brings his entourages to travel through time to current era after losing his beloved crown princess. Man From the Equator broadcast by KBS2 obviously is more serious drama. It tells the story of two men who has passion and desire fighting against destiny. How’s the fate of three new drama has aroused great concern of the media and the audience. The King 2 Hearts, Rooftop Prince and Man From the Equator will all debut on the evening of March 21st, 2012 next week.